Potato salad is a summer staple on American tables, but if you’re interested in a different take, here’s an idea for you: Potato Tuna Salad. At its most basic, Potato Tuna Salad is a close cousin to that staple of Italian buffet tables, fagioli e tonno. You take slices or cubes of potatoes that have been boiled or steamed in their skins and, while they’re still warm, dress them with tuna, red onion, parsley and a good pour of olive oil. But Potato Tuna Salad is really versatile. You can dress it up or down to fit the occasion or your mood. You can use it as an antipasto, as part of a summer buffet, as a side dish or, since it has tuna, as a light main dish. Another example of carefree summer cooking. Steam or boil the potatoes in their skins (jackets) in salted water until just tender. Drain the potatoes and let them cool off a bit. When they’re just cool enough to handle, remove their skins. The skin should be loose enough to remove by simply rubbing with your hands, but if not you can scrape off the skin with a paring knife. While they’re still warm, cut the potatoes into slices or cubes and add them to a large mixing bowl. Pour over a generous glug of olive oil, season with salt and pepper to taste and, if you like, a squeeze of fresh lemon—just a few drops will do. Add the chopped onion and parsley, along with the tuna, broken into smallish bits and one or more of the optional ingredients if using. Mix everything together very gingerly, taking care not to break up the potato pieces. Taste and adjust for seasoning. Let the salad rest for some time before serving at room temperature. If you like, save some of the tuna and parsley for topping, along with one or more of the suggested garnishes for a fancy touch. As for any potato salad, make sure to make your Potato Tuna Salad using yellow-fleshed waxy potatoes, not the ‘mealy’ kind you would use for gnocchi or baked potatoes. So new potatoes, Red Bliss and Yukon Golds are all good choices, while Russets are not. If you use mealy potatoes, your potatoes will likely turn to mush while you toss them and, even if they don’t, their soft texture won’t be very pleasing. Waxy potatoes, with their firmer texture, will stand up better to tossing. Even so, be gentle when mixing the potatoes together with the dressing and other ingredients. I actually toss everything together by moving the bowl rather than the ingredients inside it, but otherwise a rubber spatula, handled very gingerly, lifting the ingredients up from the bottom of the bowl in a circular motion, will do the job. As for any potato salad, choosing the right kind of potato and cooking it until just tender are your keys to success. Besides the choice of potato, the other critical success factor is cooking your potatoes just right. They should be cooked in their skins (jackets) so they don’t get water-logged. For even cooking, it’s a good idea to start them in cold water. And, most important of all—and the trickiest to get just right—your potatoes should be neither over or under-cooked, but perfectly tender. You can test a potato for doneness by sticking a paring knife into it. If you can remove the blade easily without lifting the potato along with it, it should be perfectly done, but do take a nibble of one of the potatoes just to be sure. 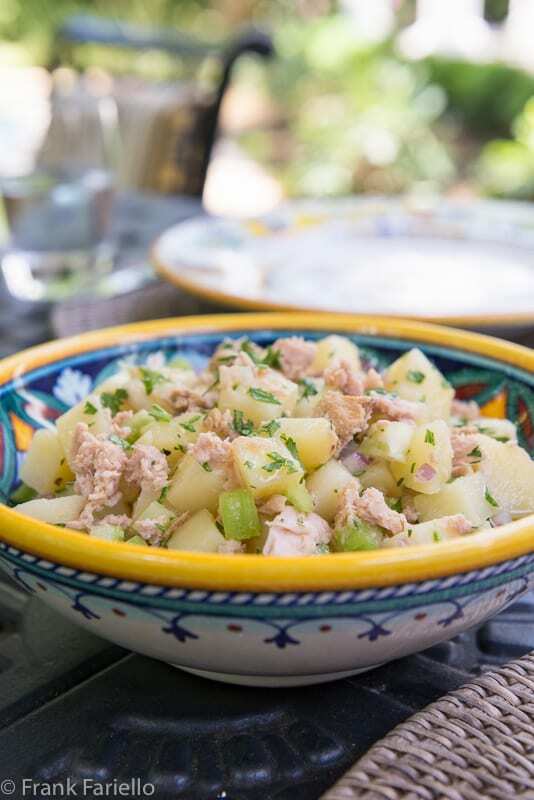 For a really fancy presentation, Ada Boni, in her classic Talismano della felicità, proposes a really elaborate version of Potato Tuna Salad, which she calls patate lesse in insalata con tonno. Her recipe calls for dressing cubed potatoes with oil and vinegar, forming them in a cone-shaped mound on a serving dish, then covering the mound with the tuna, which you will have creamed together with butter and a few drops of lemon juice. The dish is then garnished with anchovies, tomato slices and rounds of hard-boiled egg. For an elegant touch, she suggests a ribbon of mayonnaise all around. A nice idea for company. Drain the potatoes and let them cool off a bit. When they're just cool enough to handle, remove their skins. The skin should be loose enough to remove by simply rubbing with your hands, but if not you can scrape off the skin with a paring knife. While they're still warm, cut the potatoes into slices or cubes and add them to a large mixing bowl. Pour over a generous glug of olive oil, season with salt and pepper to taste and, if you like, a squeeze of fresh lemon—just a few drops will do. Add the chopped onion and parsley, along with the tuna, broken into smallish bits and one or more of the optional ingredients if using. Mix everything together very gingerly, taking care not to break up the potato pieces. I’m thinking of doing this with sardines… tuna is nice, but I don’t like to use it bc it’s seriously overfished, and the nice Italian kind that comes in jars of oil is $$$. I’m sure it would be very nice with sardines, too. Made a version with ocean trout instead of tuna, with capers and tomatoes, a bit of mince garlic substituting the onion. Thanks for the inspiration ! Sounds really nice, Francis! I’ll have to try your variation some time. Frank – this also reminds me of a Venetian dish we love with polpo (or polipo) grilled and mixed with celery, potatoes, and olives, dressed with olive oil and lemon juice. We will definitely be making your version soon – it sounds perfect for the summer. Come to think of it, yes, it does resemble that dish (which I also really love). I think you’ll find this one less work, of course! Oh this looks so, so good. The temperatures have finally gone up a bit in the UK where I live and so looking for nice salads. I love tuna and pasta but tuna and potatoes sounds really nice for a change. Will be making it this week for sure. As I will do it as a meal, I will put hard boiled egg with and my husband loves anchovies so will put a few of those on just on his plate! I think a black olive or two would not be out of place. Thanks for this!!! Sounds nice, Martha! Hope your hubby likes it. I’ve never thought to have tuna with potatoes, but they absolutely go together! I loaded up on Callipo tuna when I was in Toronto, so will have to try this with good Italian tuna! Thanks, Frank! Sounds like a great plan, Christina! Callipo is an excellent brand. Excellent summer salad choice Frank. I like all your tips for choosing the right variety of potatoes, too. This looks wonderful with the potatoes. A perfect meal for lunch or dinner. Very true, Vicki. Thanks for stopping by! mi piace l’insalata di patate ma non ho mai pensato di aggiungere il tonno, mi hai dato una buona idea, grazie ! Buon weekend Frank ! The ultimate Italian buffet dish which takes me back to our seaside times as a family in Tropea. It’s the Italian version of Nicoise Salad! Which I do once a week. Loving this (and I am partial to acid flavors). Will be doing this next week when we soar into the 90’sF for a few days. This is summer cooking at its best! Excellent. Let us know how you like it, Claudia!